This easy chicken casserole recipe is a fun twist on the classic chicken and wild rice soup that the whole family will love for dinner all year long! 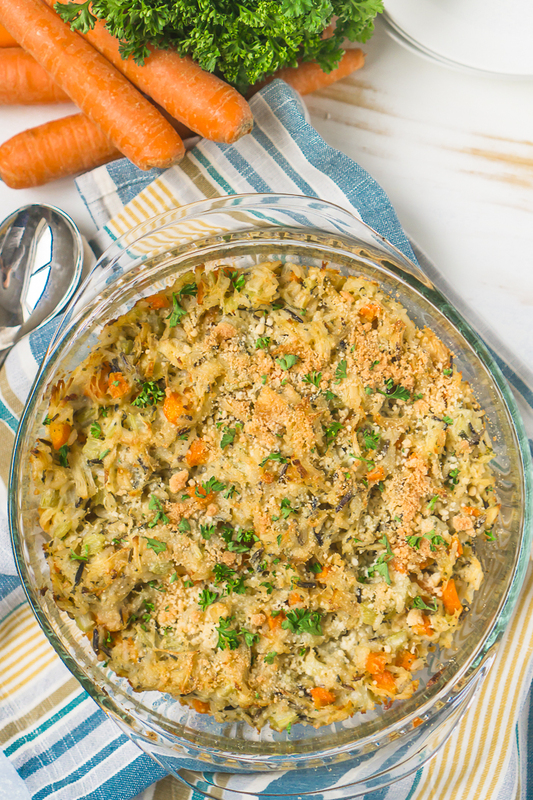 Combine chicken, wild rice, carrots, celery, onions, seasoning and a light cheese sauce for a tasty Chicken and Wild Rice Casserole dinner! A Chicken and Wild Rice Recipe You Don’t Want to Miss! We are a casserole family! For starters, casserole recipes are usually easy to prepare and toss in the oven, leaving me more time to tackle tasks around the house or play with Liam. Even more importantly though, the whole family loves them for dinner that night as well as for leftovers. Liam has been eating this Chicken and Wild Rice Casserole leftovers for the past four days and his tray is always empty! I also think casseroles have the potential to be ultimate comfort food, and this recipe definitely falls into that category. 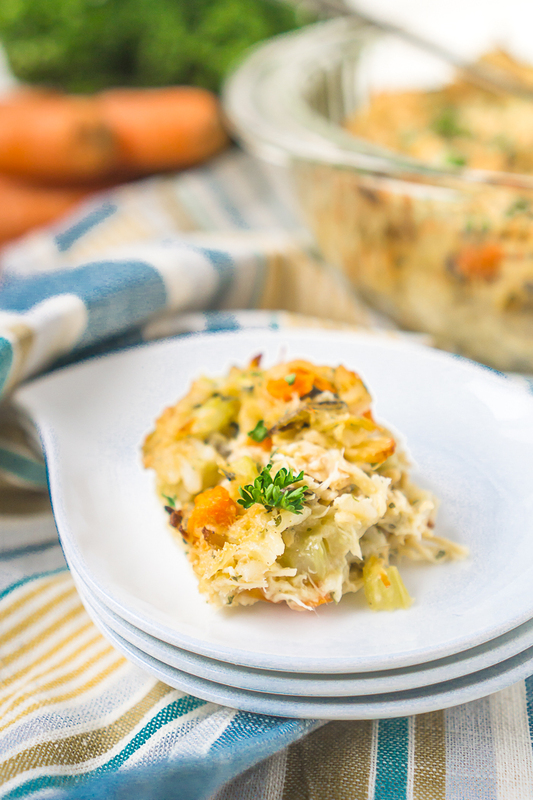 A light cheesy sauce is added to the wild rice, chicken and vegetables to give it a creamy consistency while maintaining the little crunch from the carrots and celery. I love it! I feel like casseroles can be hit or miss with some families or regions. I definitely grew up on casseroles. It is one of the easiest and most economical meal options for busy families. Most can even be prepped ahead of time and throw into the oven when ready. 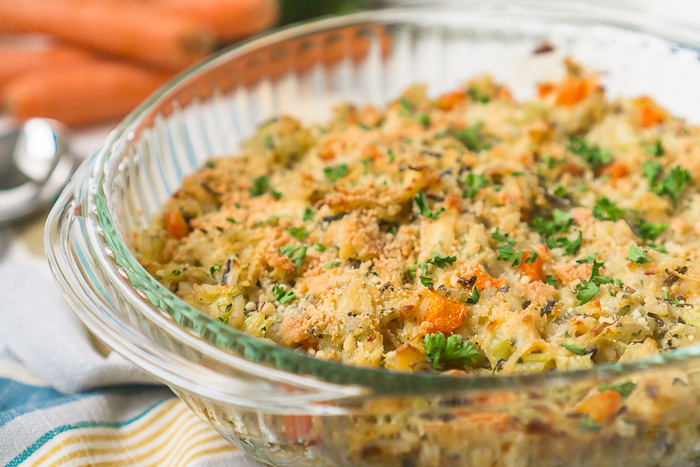 Our most served casserole in the family when growing up? A classic Chicken Casserole made with a couple cans of soup, some chicken and cooked noodles! It doesn’t get much easier than that. I’ve said it many times on the blog, but I don’t think cooking needs to be fancy to be good or special for a family night dinner. When making this recipe, I definitely recommend doing a taste test before adding to the oven, especially in regards to salt. Depending on how your chicken was prepared, the chicken broth or the rice you choose to use, your casserole might need more or less salt. For this recipe, I normally use a box of Uncle Ben’s Long Grain and Wild Rice. It does require simmering for awhile so I start this first before cutting up vegetables or the sautéing process. I have heard good things about the wild rice at Trader Joes though and have it on my list to check out. Supposedly it is fully cooked already so you can just throw it into any recipe straight away. Time to Cook Up this Tasty Easy Chicken Casserole Recipe! Combine chicken, wild rice, carrots, celery, onions, seasoning and a light cheese sauce for a tasty Chicken and Wild Rice Casserole dinner! Heat oil in a medium to large skillet. Then, saute onion, celery, and carrots for 5 to 10 minutes. The longer you saute, the less crunch your vegetables will have in the casserole. Add garlic, chicken, cooked rice, parsley, salt and pepper to the pan. Cook for 1-2 minutes and then turn the heat source off. Next prepare the cheese sauce: Melt butter in a medium sauce pan over medium heat. Whisk in flour. Then, slowly pour in the chicken broth while constantly whisking the mixture. Whisk until it thickens and then add in the cheese. Pour cheese mixture into the chicken and rice mixture and stir well. Take a small taste and make sure you like the balance of flavors or if you need additional seasoning. Transfer to 9x13 casserole dish. Top with additional cheddar cheese or parmesan if you desire and bake for 30 minutes. Love this! It looks like such an easy dish, and I love that it’s all in one. I love meals like that for weeknight cooking. You’ve got our number with this one right here! We love comfort food like this! Yum! Looks awesome. Pinning so I remember to try this! What a delicious dish! I pinned it for later!